Multi-Attribute Decision Making (MADM) is commonly used when we are comparing more than two courses of actions or alternatives based upon many selected criteria. 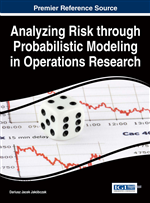 This chapter presents methodologies to conduct MADM analysis for risk analysis and risk assessment across a variety of topics. These methodologies include Data Envelopment Analysis (DEA), Simple Additive Weighting (SAW), Analytical Hierarchy Process (AHP), and the Technique of Order Preference by Similarity to Ideal Solution (TOPSIS). The author describes each methodology, provide some strengths and limitations of each, discuss tips for sensitivity analysis, and provide two risk analysis examples to illustrate each method. Multiple-attribute decision making (MADM) refers to making decisions when there are multiple but a finite list of alternatives and multiple criteria. An analytics company needs a procedure or methodology to compare recruiting offices, financial institutions, academic institutions, etc. Consider a problem where homeland security in a region has a list of potential threats and limited assets so they need to know which threats to check out. Perhaps management needs to prioritize or rank order alternative choices: identify key nodes in a business network, pick a contractor or sub-contractor, choose airports, rank recruiting efforts, ranks banking facilities, rank schools or colleges, etc. How does one proceed to accomplish this analytically? For each method, we describe the method and its uses, discuss some strengths and limitations to the method, discuss tips for conducting sensitivity analysis, and present illustrative examples. These MADM methods have been used extensively in current research and many of the research efforts are listed within each MADM technique discussion. In this chapter we will examine a threat risk assessment process that could be used by local law enforcement or homeland security to examine possible threats as in Table 1 and identifying how to find the key nodes in a Dark Network. Assume we have a social or dark network where we desire to know or find the key or influential nodes with the network. The Noordin dark network graph is provide as shown in Figure 1 and ORA output for four main metrics is provided in Table 2.